Demand for direct selling tech is up. And so is supply. This year’s DSA Annual Meeting was a flurry of activity, information and overall fun. Especially around technology. The industry is opening its eyes and its heart to technology in new ways, evidenced not only by the current incumbent providers upping their games, but from the influx of newer technology providers with interesting tools and perspectives on how to make direct selling even better. The timing is quite curious, as now that the industry is more ready than ever to embrace technology, there are more choices on how to do that then ever before. And this is just the beginning. More and more interesting and compelling tools will be entering the direct selling market as technology innovation and disruption sets its sights on an industry with so much to gain from the right technologies. The challenge lies not only in what to get now, but, more importantly, how to be ready for what’s coming. The speed of technology innovation continues to accelerate exponentially, and the direct selling world is just beginning to feel its effects. In the coming years we’ll be seeing so many interesting technologies that could help our industry flourish. No one company (whether its a direct seller or a supplier) alone will be able to create every compelling innovation that there is to be had. The time will come where your company or your field will want a new technology that neither you, nor your existing suppliers have created. Then we’ll have to ask the hard questions. The ones us nerds love, but that give non-tech people a serious migraine: What about technology infrastructure? Or, How can we get that? I’m only part nerd, so hopefully my layman’s explanation will make sense. Simply put, you’ll need a robust system that gives you the flexibility to plug into and share data with any tool that does or will exist in the future whether you build it or someone else does. Having your technology infrastructure in a silo is the technological equivalent of buying a really expensive pair of shoes that only go with one outfit. Wherever you are in your organization, if some sort of technology tool will help you or your field in the future, it’s in everyone’s best interest to make sure there’s a plan in place for your company to be able to take advantage, not only of what’s currently available, but of what will be available in the near future and beyond. Salesforce.com is a good example. As a supplier to many businesses, they’ve built a platform that not only has many of its own compelling tools for companies, but allows 3rd party developers to build tools that will plug right in to whatever their customers are already doing. Salesforce knows that no matter how big and powerful they get, they’ll never be the only place where great innovation is done. So rather than fight against the tide, they channel the flow. You can build almost anything you want on to their system. They even have a substantial investment fund, Salesforce Ventures which will invest in the few companies it sees as most promising. It’s an incredible plan for staying relevant in the long run. Some direct sales companies are seeing this tsunami of innovation on the horizon and are already well in to prepping for it. ItWorks’ CIO Chris Burns has channeled significant resources into a robust API for the company. For non-nerds: an API is essentially a secure doorway that allows in-house and third party applications a way in to parts of your system that they need to interact with – so, in addition to their own in-house development of a robust distributor back office and many other tools, ItWorks! is positioning itself to integrate with almost any compelling tool it might like in the future. There’s so much exciting change coming to our industry. Challenges to our opportunities from the sharing economy (watch a keynote on that here http://bit.ly/1dSvCmW) and the strong growth and growing ease of earning money freelance are calling upon our industry to upgrade our opportunities. Or like Doug DeVoss told me in our recent interview, “If it’s not in your DNA to do it, you’re gonna have to get there…You don’t have to be on the bleeding edge, but you’ve gotta try to get close to it.” Look at what Uber did to driving and being a passenger in a taxi? Companies who see the tide coming will build some incredible surfboards and ride the wave of disruptive innovation into a whole new era for direct selling around the world. Surfs up! Its no surprise to anyone at this point that mobile technology and specifically, mobile apps are growing at an explosive pace. The fastest growing market segment in economic history is seeing no signs of slowing down. Billions of dollars in marketing have and are being invested in moving more and more people around the world to smart phones and it’s working. 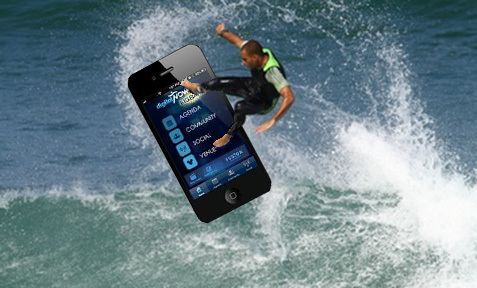 The question is: Are you riding the mobile wave? Despite its massive popularity however, the possibilities that are out there for your business are still a mystery to many business people who are leery of spending their hard-earned cash on something they don’t completely understand. There is no doubt that it can be confusing out there and confused minds take no action. So here are some basics to think about which might prove a good initiation in to the exciting world of mobile. You just have to love Comscore and all the other great research groups out there. Its an exciting time to be studying consumer behavior, thats for sure. Things are changing so rapidly and today is a perfect example of that. In just a few short years the use of mobile apps has surpassed that of the web! And mobile web browsing apps aren’t included! This says so much about us as a civilization. The speed of progress continues to accelerate and if you’re not keeping up, you’re falling further and further behind. The biggest thing we are considering is how the power of marketing can directly influence the behavior of an entire civilization.